Check out what is going in in Scottsdale this month. 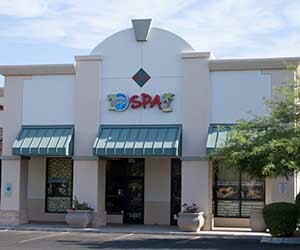 I’m so excited that the Scottsdale spa will be staying at this location! That means throughout the year you will notice some major improvements as the owners refresh our appearance with fresh paint, new lockers, renovations to the bathroom and much more! By the end of the year this spa is going to look amazing! I am happy to introduced our newest member to our desk staff, Sasha! Sasha joined us in the weekends. She has been with us since the beginning of January and is quickly picking up on how things are run at the spa. Sasha has always wanted to work in a spa and is very interested in esthetics. She is very excited to be here! We have a few celebrations this month! Angelina will be celebrating her 3rd year anniversary with the spa on February 1st.! Angelina is such an asset to the Scottsdale spa. She does a great job of helping out our other spa administrators and making sure our guests are taken care of. Another anniversary celebration is on February 15th for Hilary! Hilary is one of our kahuna estheticians. Hilary is very sweet and has been doing a fantastic job this last year building up her clientele. If you haven’t had a facial by her yet I definitely recommend you do so! She has a gentle and relaxing touch. Giscel’s birthday is on February 24th. Be sure to wish her a happy birthday if you see her in the spa! Hau’oli La Hanau to Giscel!